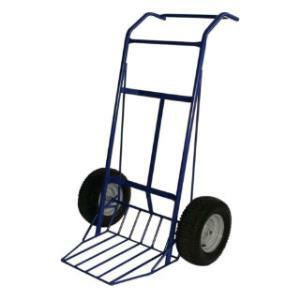 Suitable for moving large rocks, bushes, and tree root balls, this hand truck features a load rating of 1500 lbs and 15" pneumatic tires. The scoop basket measures 23" x 19", and the overall dimensions for the tree cart are 57" tall, 38" wide, and 32" deep. * Please call us for any questions on our hand truck tree cart rentals in Hillsdale and Ridgewood NJ.